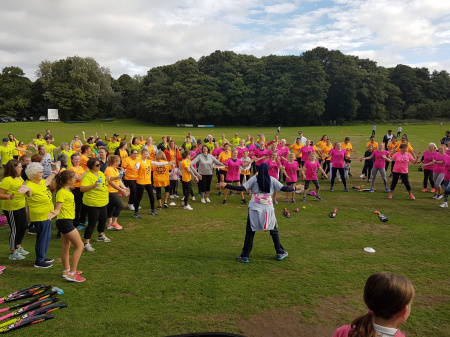 9th September sees 250 women and girls take part! Sunday 9th September saw us host our biggest day of the season for women and girls’ cricket. Host club Four Oaks Saints saw 130 women arriving in the morning, 14 teams of ladies that signed up to give cricket a go. The ladies enjoyed a Zumba warm up, ‘race for life’ and 2 fun cricket fixtures each. The ladies looked fantastic dressed in their coloured t-shirts, glitter and certainly enjoyed the prosecco. The day finished with a fantastic rendition of sweet Caroline and comments of ‘I wish I’d tried this earlier in the season’. A brilliant day which showcased the growing opportunities for female cricketers across Warwickshire. The event also supported Cancer Research UK, raising £450 for the charity. We will host one final Women’s Softball festival on 22nd September at Hampton and Solihull Cricket Club from 2-5pm. There will be a DJ, BBQ and free prosecco and Tshirts for all involved. Click here to sign up!